I have been busy at home all week working on our new kitchen, but I have a moment to share this gorgeous sight with you. 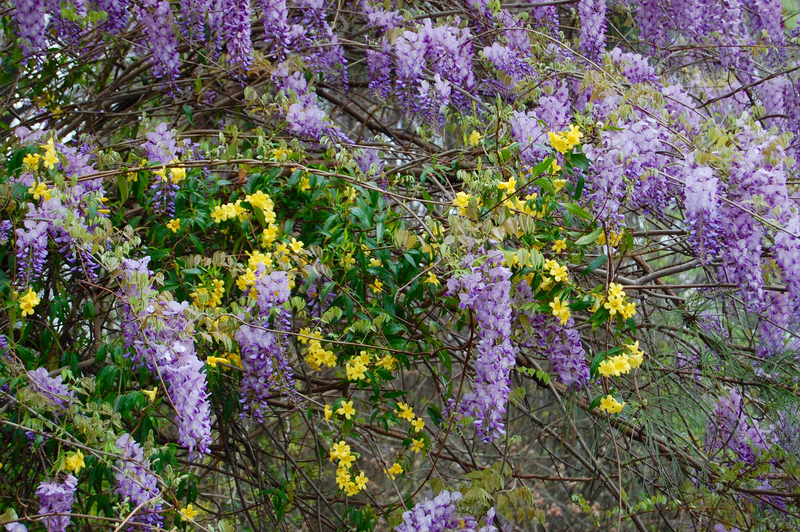 I took this picture of wild Wysteria and Carolina Jasmine on Easter Sunday. It was growing wild along the road near my church in Lawrenceville, Georgia. It’s amazing what we see when we keep our eyes open on God’s world. Enjoy! If you liked it, please share it. Thank you! Average Us is written by Lon and Dawn Hetrick, an average Christian couple with three children and three grandchildren. Lon holds a MATS from Gordon-Conwell Theological Seminary, is a former pastor, and current web designer. Dawn provides a home for our family and friends who visit while managing life-long anxiety and depression. We hope our thoughts born from hard experience about christian hope, faith, and emotional health will inspire you to hope in God who is great, even when life isn’t.